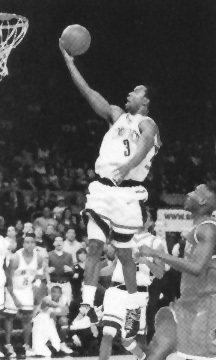 Rashamel Jones was a Forward for the UConn Huskies from 1995 – 1999. 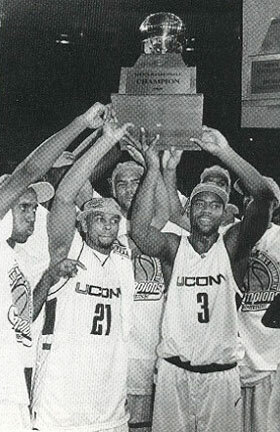 He was co-captain of UConn’s first-ever National Collegiate Athletic Association Championship Team in 1999, enjoyed winning the Big East Championship three years, and made All Tournament Team during the Big East Tournament as a junior. 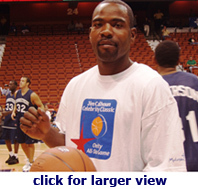 I had the pleasure of talking to Rashamel in April 2008, as he reflected on his basketball memories and experiences, and his current career path. As a youngster Rashamel was a three-sport guy playing basketball, baseball and football. “I was playing football and baseball before I ever picked up a basketball.” Rash had been on football and baseball teams starting around 5 but didn’t join a basketball team until around the age of 12. It wasn’t long before he realized basketball was becoming his favorite of the three sports. One day in the spring of the eighth grade, Rash’s gym teacher asked him what his plans were for high school. Having grown up in Mount Vernon, New York, Rash said he’d probably go to Mount Vernon or Port Chester High School. Rash’s gym teacher went on to tell him that he had accepted a new job as head football coach at Trinity Catholic High School in Stamford, Connecticut, and wanted to take Rash with him to play on his team. Rash visited Trinity Catholic with his teacher and while there he saw the varsity basketball team practicing. The basketball coach asked Rash if he wanted to join the team for the practice. Rash ended up practicing, and was able to dunk the basketball on Trinity’s player who played center position. Trinity’s basketball coach was pretty impressed, and invited Rash to Trinity to play for his team. The basketball coach talked to Rash’s father, and they left the decision up to Rash. “I said yeah I wanted to give it a shot, and it was the best decision I had made at that time of my life. It just opened up so many doors for me.” It was the right decision to focus on basketball rather than football. Rash was tall but not big. Basketball was going very well, and he didn’t want to take the chance of getting hurt playing football. “The decision made sense, and I have no regrets.” Although Rash’s eighth grade gym teacher had invited Rash to Trinity to be on his football team, Rash actually never even played on the football team. Rash proceeded for the next four years to get on a 7:00 a.m. train in Mount Vernon arriving in Stamford, CT at 8:00 AM, then taking the city bus arriving at Trinity Catholic around 8:20 AM every morning, then returned to Mount Vernon each night. While at Trinity, Rash was in the starting lineup all four years, and set records as the all-time leading scorer in Stamford. In the state of Connecticut he is the fourth or fifth all-time leading high school scorer. A game that Rash hasn’t forgotten was during his senior year when Trinity Catholic lost the state championship game to New London High School. Rash was named Fairfield County Player of the Year three out of his four years, and during his senior year was the state of Connecticut and the Gatorade Player of the Year. Rash started getting college recruitment letters as a freshman in high school, and by the time he was a junior his coach was giving him boxes of letters. “It was like receiving a 100 pieces of mail a day by the time my junior year came.” Having made up his mind to stay on the East coast, Rash was able to eliminate a lot of schools. His choices were Boston College, Florida State University, University of Massachusetts, University of Connecticut and Indiana University. As a senior, he had it narrowed down to UMass, UConn and BC. “I wanted my relatives to be able to see me play, so for that to happen, I had to stay within the Tri-State area. UMass coach John Calipari (at that time) came to visit Rash’s family. After he left, Rash’s grandmother commented he was like a car salesmen, telling you everything you want to hear. BC Coach Jim O’Brien (at that time) came for a visit but he was too laid back for Rash. Coach Calhoun came for a visit and Rash said, “I was used to an in your face type of guy. 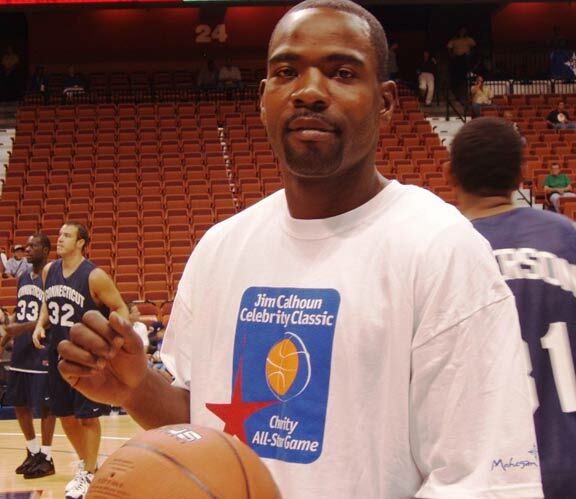 Watching Coach Calhoun, during games seeing his style, I knew, that’s where I needed to be.” Rash talked with some of the UConn players, and they all had great things to say about Coach Calhoun, and the basketball program at UConn. At the beginning of his senior year of high school, Rash announced his decision to go to UConn. As a senior, and after winning the National Championship, things got pretty busy. Rash was offered a contract to go overseas to play basketball in Europe. “That was my dream, to play professional basketball whether it was in the US or in Europe, so I accepted the contract, and left for Europe.” While there Rash visited Italy, Spain and Australia, and was able to learn and see a lot. Rash played in Europe for two years then in 2001 he had a knee injury. He came back home to Mount Vernon for rehabilitation. He worked a few different jobs for a while, and then realized that what was most important was to go back to UConn to finish working on his Bachelors degree. After graduation Rash worked for the CT Dept of Children and Families for over two years. Since December 2007 he decided to move closer to home and is currently managing Hooperstown, a sports complex, where some of his responsibilities are coaching an AAU Program, giving individual or group lessons and putting together and running basketball camps.